The 2014 Iowa Senate race was a hard-fought campaign between two individuals that had vastly different visions for the future of America. In the red corner was Joni Ernst, a former lieutenant colonel in the National Guard and a member of the Iowa Senate. Ernst’s political career had been running smoothly and had been developing momentum since she was elected Montgomery County Auditor in 2004. 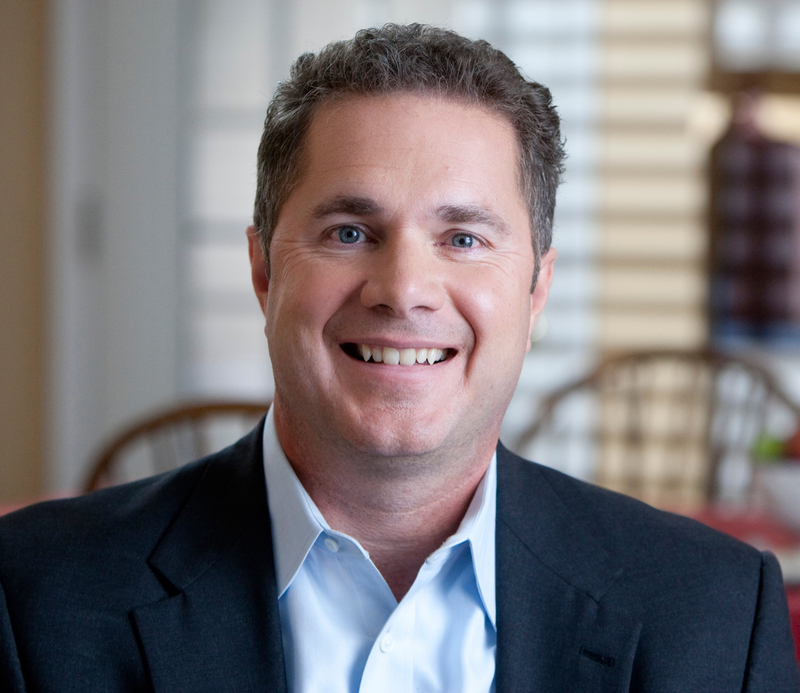 In the blue corner was Bruce Braley, a member of the U.S. House of Representatives and successful trial lawyer. Braley had served in Congress since 2007, and it was time for him to take the next step: the U.S. Senate. Unfortunately for Braley this dream didn’t work out in his favor, but why? How can a U.S. Representative that has been consistently reelected by large margins lose to a relatively new member of the Iowa Senate that wasn’t initially electorally popular for any reason other than one television advertisement? The importance of this election is not to be understated, as it was viewed nationally as the central indicator as to whether the Republican Party would take control of the U.S. Senate. Iowa has historically been a conservative state, often electing Republicans to Congress. In fact, in the entire history of Iowa, Iowans have sent 27 Republicans to the Senate, and only 11 Democrats. The Iowan delegation to the House of Representatives is not much different, 154 Republicans to 54 Democrats, with the Democrats usually serving far shorter terms. 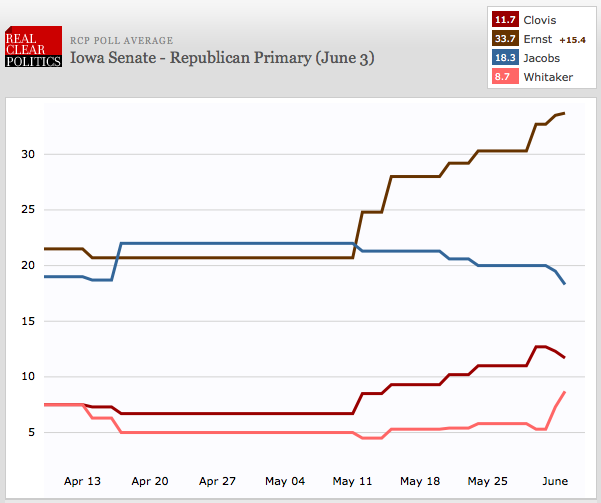 However, the recent trend indicates a far more purple political reality in Iowa. Democrats have made a fair amount of progress within the past few decades, with some districts turning blue and sending Democrats to Washington much more often than history would have us predict. This leads us to speculate whether the red wave of November 2014 was a bonafide partisan shift, or merely a product of temporary circumstance; attributable to the presidential party backlash almost always seen during a mid-term election cycle. Bruce Braley was part of this recent Democrat progress, coming in with the wave of Democrats that were elected as the American financial sector was crumbling in 2006, beating out Republican Mike Whalen by a comfortable 12% margin (BallotPedia, 2014). Democrats have struggled to maintain this advantage after taking control of all three branches of government at the federal level, but due to the unpopularity of the Affordable Care Act, Republicans have now erased all of the aforementioned Democrat gains and more. Bruce Braley was one of the few new Democrats remaining in 2014; with “new Democrats” being defined as Democrats that came from otherwise conservative congressional districts that were only elected out of voter disdain for the Afghanistan and Iraq wars in the mid 2000’s. After all, Braley’s 1st Congressional District seat in the U.S. House had been controlled by Republicans for 89 of the previous 101 years prior to his first victory (Office of the Clerk, 2015). Perhaps it was that Braley underestimated current voter disdain President Obama and anyone that was a member of the Democratic Party. Braley was hanging onto his House seat in a historically very conservative district, but he assuredly did not have the prospect of Tom Harkin’s Senate seat locked down. However, the stars aligned and gave Braley arguably the best chance he would get to take this step up, presenting him with a mediocre Republican field and plenty of leftover 2012 campaign funds to take his shot. Braley attended Iowa State University in his youth, and received his Juris Doctor from the University of Iowa College of Law. After this, he started his long career as a trial lawyer, and following his Senate campaign loss, now litigates full time once again. In the years leading up to 2014, he had taken steps to eventually prepare himself for the Senate. In 2006 Braley won his first campaign by a significant margin, 55.1% to 43.2%, after the 1st congressional district seat was vacated. He followed this up with another win, 64.6% to 35.4% in 2008, 49.5% to 47.5% in 2010, and 56.9% to 41.6% in 2012. His constituents had, for the most part, decisively (with the exception of 2010) chosen him to represent them. 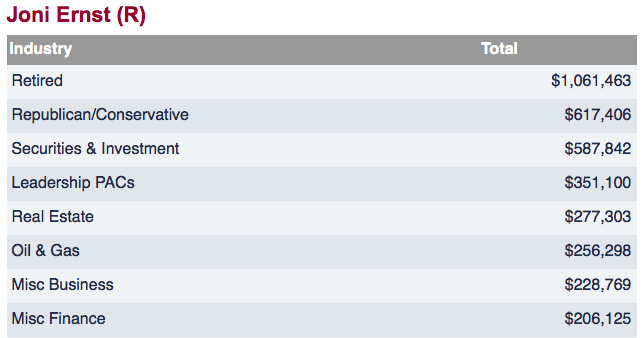 Fortunately for him, in his run for Senate in 2014, Braley faced no opposition in the primary (BallotPedia, 2014). Polling long before the primaries, in 2013 and early 2014 steadily showed Braley with a decisive lead to the tune of 6%-12%. He had established name recognition, a proven campaign organization, and no challenge in the primary, which gave him an advantage over whoever his opposition would eventually be. Because of this, Braley only had to run a textbook campaign. There was no need to be inventive, to experiment with anything new, or for him to even begin running negative campaign advertisements about Ernst. With his early lead and plenty of campaign funds, he was comfortable going into the race. It wasn’t until Ernst had won the Republican primary, and her organization released a video of Braley making a questionable comment about farmers, that he began to lose ground. In early June, polls began to show Braley trailing Ernst as negative campaign ads flooded Iowans’ TVs. Braley’s advantageous position had been completely eliminated, and the status quo had been turned upon its head. A textbook campaign would no longer suffice, and he would find it necessary to resort to more incendiary campaign strategies, like negative ads about Ernst, to defend himself. Voters now had video evidence that Braley may not be who he claims to be, and the Braley campaign found it easier to defame Ernst rather than attempt to erase negative perceptions of Braley from the voters’ minds. This new foundation created a far more volatile campaign, and from June until Election Day, the race was a complete toss-up with practically each subsequent poll showing a different candidate in the lead (Real Clear Politics, 2014). The aforementioned “comment” was a remark he made about Iowa Senator Chuck Grassley, and this early misstep eroded much of the fundamental advantage he had going into the election. Braley hosted a fundraiser for his Senate campaign in January 2014, and invited fellow attorneys in an attempt to persuade them to donate to his cause. He cited his prospective appointment to the Senate Judiciary Committee, and his background in law; implying that he would ensure that the Senate didn’t pass any legislation that would be harmful to lawyers’ practice, saying, “If you help me win this race, you may have someone with your background, your experience, your voice … on the Senate Judiciary Committee. Or you might have a farmer from Iowa who never went to law school, never practiced law, serving as the next chair of the Senate Judiciary Committee.” A video of Braley making these comments was released by a conservative political action committee, America Rising, and his opposition ruthlessly capitalized on his poor choice of words for the entirety of the campaign. Despite apologizing to Senator Grassley and the public, Braley never recovered from this mishap (Lachman, 2014). Iowa has a massive amount of agricultural, and naturally a large population of farmers. Braley’s comment taken out of context looks like an obvious attack on farmers’ intelligence, when in fact it is clear that he meant that farmers don’t typically have an education in public law and the judicial process, and that an attorney would be better suited to serve on the Senate Judiciary Committee, which is a fair assertion to make. However, no amount of apologies would have erased the damage he had done to his campaign. Braley’s obvious strength is the connections he has and his ability to fundraise. Money was of no shortage to him, and “At the end of 2013, Braley had more than $2.6 million in his campaign account,” (Sullivan, 2014). In total, Braley raised $12,082,748 for the campaign, with 77% coming from itemized and un-itemized individual contributions (Federal Election Commission, 2014). His early money put him in a great position to control how he wanted his campaign message to emerge, and to what magnitude he wanted his campaign to have a presence in Iowa early on. However, because of his Grassley comment, he was thrust into the spotlight much earlier than he had anticipated, and was forced to start burning money to erase the negative image voters had about him. In retrospect, it may be safe to say that he should’ve let the gaffe fizzle out and not spend money trying to refute what the opposition was saying, but this knee-jerk spending reaction can nonetheless be perceived as a reasonable course of action to have taken given the circumstances. As for outside spending, there was a total of $23,751,533 in money coming from outside the state that was spend on Bruce Braley, with $4,244,593 spent in support of him, and $18,841,528 opposed to him (Center for Responsive Politics, 2014). Joni Ernst, Montgomery County native, attended Iowa State University and joined the National Guard after her graduation. She was deployed during the Iraq war in 2003 and led 150 other servicemen and women in Kuwait and Iraq as a Lieutenant Colonel (Ernst, 2015). These credentials helped to give her campaign something tangible for voters to rally around, and certainly bolstered her position relative to her opponent Bruce Braley. She won her seat in the Iowa State Senate in 2011 in a special election after the seat was vacated with an impressive 67.4% of the vote, spending $128,208 to win it. She was subsequently reelected in 2012 when she ran unopposed. Ernst has since served on various committees, which helped to build momentum behind her as a rising star in the Republican Party (Ballotpedia, 2014). Ernst faced a difficult Republican primary in the 2014 Senate race. There were five total contenders, and being a new face in the Iowa legislature, she didn’t necessarily have much to differentiate herself from the rest of the pack. Her competition was famous, qualified, and well funded. Among them were the former CEO of an energy company Mark Jacobs, the popular radio host Sam Clovis, the former U.S. Attorney Matt Whitaker, and Scott Schaben. Ernst had largely trailed the pack until she released her famous “Squeal” advertisement in March of 2014 which was an instant success and received national attention due to the content of the commercial, in which she says “I can castrate pigs so I am the perfect conservative for Iowa to send to the Senate . . . I grew up castrating hogs on an Iowa farm. So when I get to Washington, I’ll know how to cut pork. Washington’s full of big spenders. Let’s make ’em squeal.” The voters loved the message, as Ernst perpetuated the state-versus-federal narrative that so many citizens enjoy hearing. This and one other clever commercial gave Ernst instant notoriety, and she led the polls until Election Day, ultimately winning with 56.2% of the vote (Ballotpedia, 2014). Jacobs, overall, raised a staggering $3.1 million for the primary campaign; eclipsing the $1 million Ernst raised which is neither a small sum (Hohmann, 2014). Unfortunately for Mark Jacobs, his $3.1 million only bought him 16.8% of the vote. Clovis, despite raising only $282,000, ultimately came in second place with 18% of the vote share; no where close to Ernst’s impressive 56.2% (Hayworth, 2014). Matt Whitaker captured 7.5%, and Scott Schaben came out with 1.4% of the vote. Immediately following her victory in the primary, Ernst’s backers began ruthlessly advertising Braley’s January gaffe. Negative campaigning was a central strategy employed by both camps during this race, but Ernst’s campaign used it far more; but this was largely because Braley gave them more material to use. Indeed, Ernst ran an airtight campaign, with no slip-ups that ever became heavily publicized. Braley had to resort to criticizing her for who was donating to her and her stances on issues. However, Braley was not wrong to lambast her on her political positions, as this was the only real Achilles heel of Ernst’s campaign; she holds very atypical views, far more inline with the Tea Party than the mainstream Republicans, even on issues where the people are in nearly universal agreement. Ernst supports repealing the federal minimum wage, disbanding the Department of Education, disbanding the Environmental Protection Agency, repealing the Clean Water Act, banning abortion, and much more (KCCI, 2014). For Braley and nearly any other candidate that has run a campaign, Ernst’s positions could be considered ripe to be taken advantage of and exploited to discredit her to the electorate. The Affordable Care Act (ACA), one of the most salient political issues at the time, was addressed on several occasions, but mostly in TV advertisements. Braley supported the legislation as whole, but thought there was room for improvement. Ernst repeatedly called for the repeal of the Act and the dismantling of the state and federal exchanges (KCCI, 2014). Whether each candidate truly believed in the stances they took, we will never know, but each position did play to each base appropriately. Because the ACA was so divisive at the time of the election, the Braley campaign steered clear from initiating the debate on it. Every occasion that it was introduced as the topic of discussion was initiated by Ernst campaign, and rightfully so. Despite their very clear positions on the main issues in contemporary American politics, issues are not what decided this election. Joni Ernst has an impressive natural charisma. She has a Clinton-like personality, insofar that she is likable, charming, and very pleasant to listen to if you are any average voter that is looking for reasons to like a candidate. 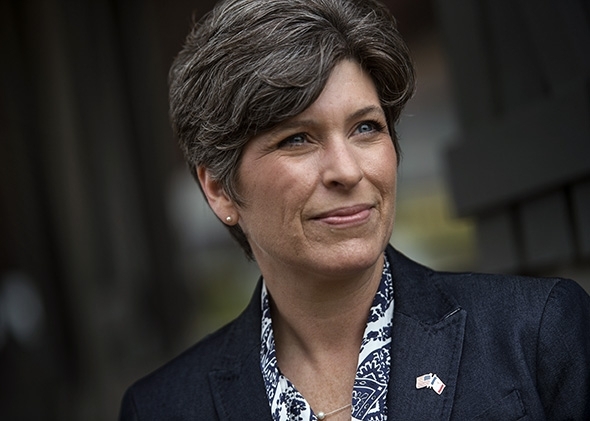 Ernst possesses a personality characteristic that allows her to make a connection with voters on a personal level; something the Bruce Braley tended to lack when he needed it most. When you set aside the politics, she was just simply more likable, and had a personal touch that couldn’t be matched by Braley. Additionally, Ernst showed promise in the fundraising realm, despite many having doubts that traditional conservatives throughout the country would throw their money behind a newcomer, and furthermore a newcomer that had such Tea Party reminiscent positions on the issues. 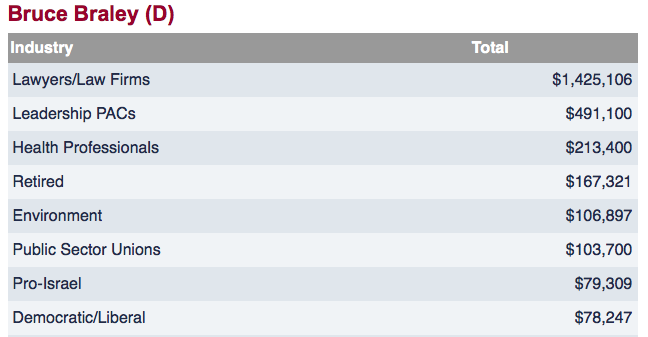 Ernst raised a total of $12,011,101, with 80.1% coming from individual contributions, a very impressive feat. But, because she had a primary to deal with, by the time she reached the general election campaign she had already spent $461,206.00 (Federal Election Commission, 2014). This and Braley already having $2,600,000 in his war chest put Ernst at a disadvantage, and forced her to raise more money, and to make what money she had go further. There was a total of $37,544,557 in money coming from outside the state that was spent on Joni Ernst, with $12,244,939 in support of her, and $25,196,618 opposed to her (Center for Responsive Politics, 2014). A recurring theme in the Iowa Senate race was both sides accusing each other of receiving money from billionaires. For Braley, there were many advertisements that aired informing voters of Ernst’s ties with the billionaire Koch brothers. He called Ernst out on that personally during their debate when asked about renewable fuel standards, saying, “I’m not sure that’s what Senator Ernst told the Koch brothers when she went to their secret meetings.” From Ernst, there were countless advertisements telling voters that Braley had taken money from billionaire Tom Steyer, and she also personally called him out on it during their debate in response to Braley’s claim, saying, “You are being funded by Tom Steyer, who is a Californian billionaire extreme environmentalist,” (KCCI, 2014). All in all, this strategy for both sides was a zero-sum game, and it was not a wise strategy for Braley to employ. He should have known that Ernst could refute his point in the way that she did. Once Braley had made the original claim, Ernst’s hands were tied, and she was forced to call Braley out on his connection with Tom Steyer. Braley was the pot that called the kettle black. Regardless of how effective of a legislator Bruce Braley was, the reality of his tenure as a U.S. Representative is that he was originally elected during the Democrat wave of 2006, in which the party picked up thirty-one seats in the House (The New York Times, 2006). Thus, if an unpopular President Bush got him elected, an unpopular President Obama certainly wasn’t helping his cause this go-around. Republicans have applied relentless pressure since the massive gains the Democrats made in 2006 and 2008, rooting out all of the new democrats that found a seat during the Great Recession. From this perspective, Bruce Braley actually held onto his seat far longer than many of his fellows that got the boot when the public revolted in 2010 and gave the Republicans sixty-three new House seats. If nothing else, the fact that Bruce Braley is the longest serving Democrat in the history of the Iowan 1st Congressional District (dating back to 1845) is proof enough that he has either represented his district extremely well, or that he exploited a temporary wave of liberal sentiment very well. Whatever the reason, the people in his district were happy with him being their representation in Washington D.C. for the better half of a decade. Iowa is demographically one of the least diverse states in the nation. Whites comprise 88.3% of the population compared to 64.2% nationally, while Blacks account for just 3.0% compared with 12.2% nationally (County Health Rankings, 2015). Of the 3,074,186 people that live in Iowa, 2,142,304 are registered to vote as of November 2014, giving Iowa a 69.6% registration rate (Iowa Secretary of State, 2014). This actually puts Iowa in the better half of the country for voter registration rate, 13th, as of 2012 (Pew Charitable Trusts, 2014). As for turnout in 2014, the turnout in Iowa was 50.2%, 7th highest in the nation. This is likely attributable to not only the highly contested race, but also because Iowa allows for same-day voter registration (Nonprofit VOTE, 2015). There is no doubt that Iowa’s relatively high mid-term turnout helped Bruce Braley, and there is also no doubt that Iowa’s extremely low black population helped Joni Ernst. The lack of a diverse population is relatively unique to Iowa and few other states, and this is one metric that makes it more difficult for Democratic candidates to win in the state. Though to be fair, this demographic composition has obviously not been the source of any electoral trouble for Braley in years past. Joni Ernst was also successful in turning the Iowa Senate race into an “Iowa versus Washington” race, and was arguably her central goal and campaign strategy. Ernst consistently returned to this theme, forcing Braley to spend his valuable time trying to refute the notion that he was a part of the inoperative Washington machine to the point of almost trying to convince voters that he wasn’t a member of Congress. Embodying this central strategy of Ernst’s is a statement she gave immediately after she won the primary, saying “This campaign will come down to a very simple choice: our shared Iowa values, versus Bruce Braley’s liberal Washington values,” (Politico, 2014). The 2014 Iowa Senate race can be summarized as follows: Bruce Braley may have been the more experienced legislator, but Joni Ernst knew how to campaign better. This touches on an interesting phenomenon in political science; that it takes a different set of skills to get elected to legislate than it does to legislate, and because of this, sometimes individuals who aren’t suited for the actual work are the ones that win elections. Joni Ernst was better able to connect with the voters by simplifying the issues down to digestible chunks of information. She’s charismatic and influential. Bruce Braley seems to have an outstanding grasp on the specifics of the issues and a more mainstream average position on the current issues that matter and issues Ernst created, but seemed standoffish and un-relatable enough to make voters remember him for it. 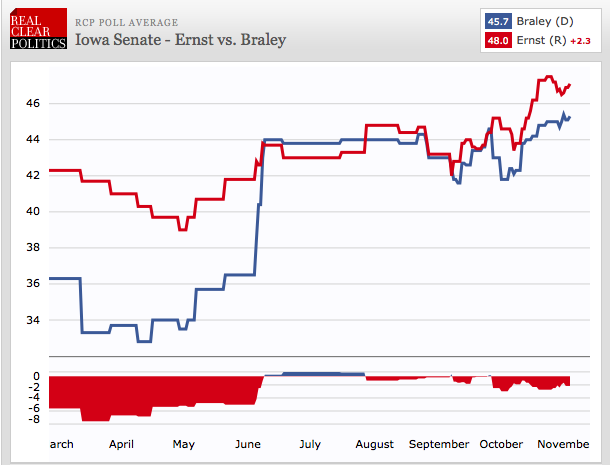 Braley may not have been able to survive the “red tide” no matter what happened, but the quality of his campaign in contrast to Ernst’s certainly made it impossible. Ernst turned Braley into an outsider, and convinced voters that he was completely disconnected with the reality of their shared condition. County Health Rankings. (2015). 2015 Iowa Summary Report. University of Wisconsin. Madison: County Health Rankings. Iowa Secretary of State. (2014). State of Iowa Voter Registration Totals. Des Moines: State of Iowa. Nonprofit VOTE. (2015). America Goes to the Polls 2014. Nonprofit VOTE.